Today after 2 months from releasing PRE_03 I have released PRE_04 with a lot of the very requested changes ! This has been requested very much by a lot of people, and here it's now. Now you can run, save and reload the game by pressing ctrl-r, ctrl-s, ctrl-l.
Any game that uses btn() and btnp() functions will automatically get the joystick controls. The circle() and the ellipse() functions now support passing a number of segment for them to use, check the official documentation site. There's now a new command to install a set of game shipped with LIKO-12, and in each new release I may add any game made by the community, so share us your work ! 2. New hex string sprite copy format. 3. Now can paste from PICO-8 and TIC-80, and can also copy to TIC-80. 4. New sprite editor selection size slider. 5. New `install_games` program, to install a set of built-in games. 6. New games: Snake, minesweeper, batteryman, pong. 7. New sprite editor shorcuts, check the docs for them. 8. New `loadcart` program to load old LIKO-12 V0.0.5a carts. 9. New joysticks support, with unlimited number of controllers. 10. New `joymap` program to remap the joystick buttons. 11. New controls test demo `joytest`. 12. Added support for installing custom editors. 13. 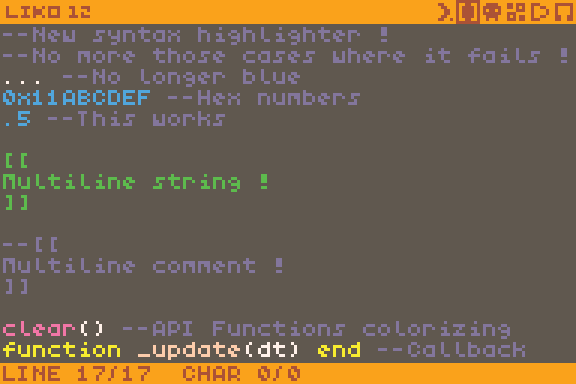 New lua syntax highlighter by lhs_azevedo. 14. 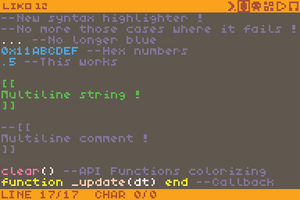 Now colors the api functions in the code editor. 15. New `exit` command, the same of `shutdown` command. 16. New ctrl-s, ctrl-l, ctrl-r works in the editors and the edit program. 17. New copy program to copy single files. 18. circle() and ellipse() now accepts segments count argument. 19. New `pastebin run` varient. 21. Now system messages are shown when starting, pauseing, etc... the gif recording. 22. New selection functionality in the code editor to copy, paste, etc... \o/. 23. New math functions: math.isConvex, math.triangulate, math.noise and math.randomNormal. 24. New 'mathcircles' Demo by @egordorichev, check it out ! 2. New sprite editor layout. 1. Bugfix appdata program oppening the appdata folder after showing help. 2. Fix some internal cursors hot position. 3. Fix `appdata` and `folder` programs on Android to print the path instead of openning the browser. 4. Fixed a bug that the shaders fail to compile on some opengl-es devices. 5. Bugfix issue #107 "Invalid Print Alignment"
1. New Editor.utils, makes adding standalone editors more easier. 2. New editors api function `eapi:addEditor()`, Allows you to add custom editor. 3. Made the terminal commands case sensitive. 4. New temp folder `C:/.temp/`, Gets cleaned at startup. 1. Now uses `r8` canvas format instead of `rgba8`. 2. `NormBIOS Revision 060-011`: New file tracking when in devmode. 3. New system messages functionality. 4. New `CPU.getSaveDirectory` to get the real save directory in the host filesystem. 5. Added `os.date` to the lua sandbox.